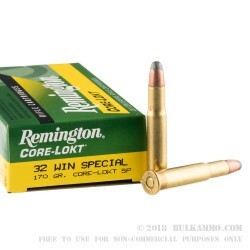 This 32 Win Special cartridge by Remington features a 170 grain Core-Lokt soft point projectile. The bullet’s tip has a broad profile so it can deliver great energy at impact, which helps its soft point to expand rapidly within a target for quick takedowns. The bullet’s soft core is locked into place by its jacket to provide better weight retention for deep penetration. Along with its fast 2,250 fps muzzle velocity, the culmination of its bullet’s ability to expand up to double its diameter while traveling so deeply makes this round a great choice for deer season. The big bucks won’t know what hit them. 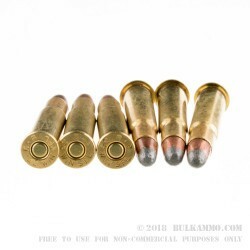 This round further offers a non-corrosive Boxer primed factory fresh brass casing. 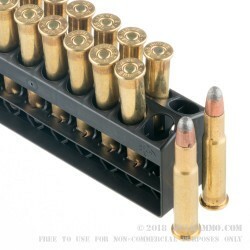 It’s fit for handloading, so even 20 of these rounds can outfit you well for quite a few years. Get a box and see why Remington touts Core-Lokt as “the deadliest mushroom in the woods for more than 75 years.